On Friday night against Cal, Pitino’s Louisville Cardinals were a lot less “Spago” and a lot more “Olive Garden,” as they came out flatter than a slice of carpaccio and never fully recovered. Apparently, Pitino did less than a “bellisima” job of prepping his players, perhaps over-stirring them before gametime. The Bears came out on fire, scoring the first 12 points of the game, and burning out to a 22-4 lead, while the undisciplined Cardinals were throwing up bricks and airballs from all over the court. When they finally settled down, they whittled the lead down to single digits… until a forty-foot buzzer-beater by Jerome Randle sent the Bears into Halftime with a 41-30 lead. Cal built the lead back up to 15 in the 2nd Half, until Pitino made one good move — He relied on unsung Rakeem Buckles. Buckles, who averages 3 and a half points a game, was the only Cardinal whose shots even came CLOSE to the rim for a while. He ended up leading the Cards with 20, and he helped Louisville cut the lead all the way down to four points, with 7 and a half minutes to go. But a Theo Robertson Three-pointer put the lead back to 7, and then the Bears made their Free Throws to pull away from the desperate Cardinals, for a 15-point victory. Pitino gets credit for his kids not quitting, after such a horrible start, and after falling back again in the 2nd Half, but Pitino also gets the blame, not only for the Cardinals coming out so tight and unagressive, but for the lack of composure that they showed down the stretch. In fact, Pitino lost his own composure after a Louisville foul was called Intentional. Pitino got hit with a “T,” and the ensuing Free Throws ended any hopes the Cards had of prevailing, and left the Pac-10 with a sterling 2-0 record after Round One of March Madness. Apparently, Pitino handles himself better in Porcini’s than on basketball courts. I wonder if any of his kids get a warm feeling when their Dad gets exposed like that. It looks like KARMA has not only CAUGHT UP with cocky SCumbag Women’s Basketball Coach Michael Cooper, but it backed up and rolled over him again. If you recall, Cooper cried out “F*ck UCLA! !” at a Press Conference after the women of troy beat the Bruins earlier this year. Then the Bruins came back and BeatSC, and BeatSC again in the Pac-10 Tournament. But Cooper didn’t realize just how costly that last loss was. Last week, when the NCAA Women’s Tournament seedings were announced, arrogant Cooper was so SURE that his team was going to make it, that he had all the players assemble at Galen to watch the announcement, all primed to celebrate. Instead, they were all shocked, stunned, depressed, and probably angry — at Cooper, for making them come down there to be humiliated in front of the Press. I don’t really like to make fun of trojan WOMEN too much, even though they did CHOOSE to go there, but Cooper’s ARROGANCE, and refusal to accept the possibility that the world doesn’t rotate around u$c, just epitomize what trojans are all about. And when that egotistical attitude blows up in their faces, it has to be chronicled. Sorry ladies — this isn’t about you, it’s about your deluded, no-Class “leader.” Enjoy the Tourney, Coop… on TV. 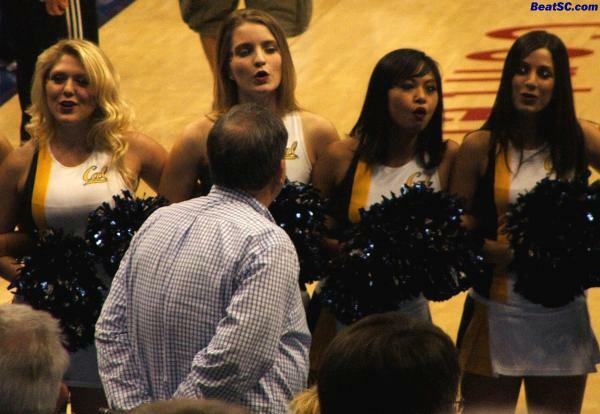 "PITINO’S BOYS GET LICKED, BUT THIS TIME IT ISN’T CONSENSUAL" was published on March 20th, 2010 and is listed in News from the Dark Side, Non-Rivalry News, UCLA/usc/Cheerleader Photos.